Summer – my ultimate, favourite time of the year. When I think of Summer I think of hot nights, the outdoors, bright colours and many amazing childhood memories. Although I’m much closer to it now, I didn’t grow up by the beach. My summer days were spent running amok in the garden or jumping in the pool. Naturally this means my go-to summer styling is more along the lines of garden or pool parties – filled with colour and life. “Bringing summer home” is a term that brings the biggest smile to my face. It’s a term that’s filled with those childhood memories and its one that I think is super easy to achieve! Be it fresh cushions on the sofa, bright new artwork, a fun rug or a unique piece that is perfectly suited to the season – it’s the perfect time of year to have fun and celebrate with your home and your lifestyle. Splash some colour on the walls – This artwork is so simple, but really epitomises summer! The colours, the mess and the fun that would have been had creating it! 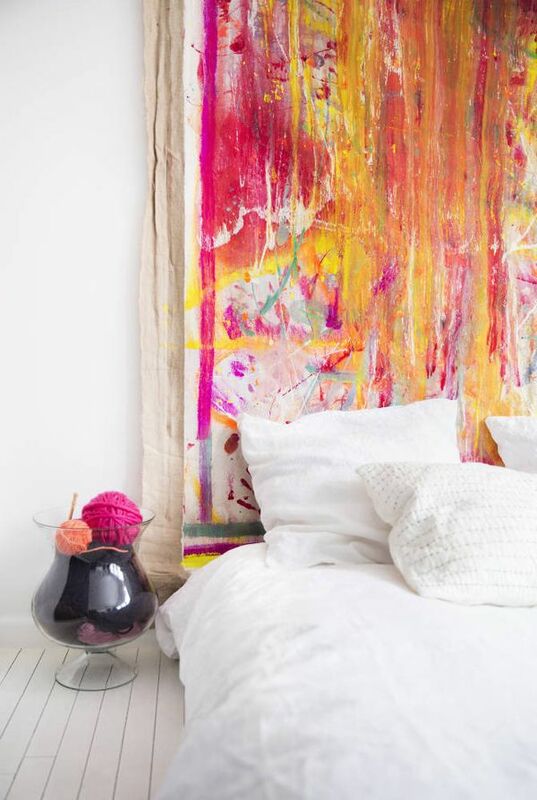 Not only that, but its setting in an all white room lets the artwork’s playful nature fill the space with life, colour and fun – just what summer is all about. Bring it in – The outdoors that is! There is nothing better in summer than having open spaces that transition from the outdoors, in. Open the windows, open the doors and let the warm summer wind bring all it’s sweetness into your home. Use pot plants or small potted trees to bring life into your home. Not only will it give your home it a bit of a summer vibe, but it will freshen the air and provide a fresh new architectural element in your home too. Hang out – Everyone loves a hammock, I mean just the thought of lazing away in a hammock with a good book takes me to a dreamland that’s sad to leave. Hammocks don’t only have to be for summer. Hammock chairs are a perfect addition in place of a standard armchair (just make sure it’s secured in properly) that can be used indoors or out, making them an amazing addition for the warmer and cooler months too. This colourful chair hammock below screams summer! It would be an amazing conversation starter and is just as fun for kids as it is for adults. If multicolour isn’t quite your thing, then there are lots of neutral options that will also look great all year round. Be Sleek and Cool – This kitchen ticks both those boxes and really does have a summer vibe to it. Open & airy, cool to touch (thanks to the marble), fresh whites and summer’s favourite colour – orange. It’s got just the right mix of sophistication and colour. Dive right in – Nothing quite says summer like swimming and coral. Artistic pictures of loved ones swimming or underwater shots are a great way to bring an element of cool on those hot summer days. Frame and set in a simple vignette with coral and some fresh greenery, and you’ll be back to the pool with piña coladas in no time!